Are you going on holiday? but just NEED that last minute make. How about Butterick Pattern 6224 which I am offering you as our #PatternoftheWeek this week with 50% off! It is described as fast and easy and let's face it that's what we need as a last minute make! I think any of these garments will fit quite nicely into an already bulging suitcase! The pattern consists quite simply of a jumpsuit in 3 lengths and a shortish Kimono style cover-up. The pattern is designed for lightweight woven fabrics so our sumptuous range of Viscose fabrics will fit the bill perfectly. This also comes in Green, Lime Green, Pink and Tan. This has definitely been a top seller for us here at Minerva, not just the fab colour range but also the price. Just £2.99 per mt while stocks last. This would be ideal for any length of jumpsuit or even the kimono. They have used my favourite pockets on this pattern, take a look at the following photo. If you look at version A/C the jacket could be made out of the above fabric with a co-ordinating plain viscose for the jumpsuit underneath. This fabric is very striking and also comes in Royal and Teal. So again ideal for the kimono but if you want to be bold as well as beautiful go ahead and make the long jumpsuit in one of these fab fabrics. You'll certainly be pleased with the price because yet again this is one of our clearance fabrics priced at just £2.99 per mt. To completely 'flip the coin' so to speak, my last Fabric for today is equally nice but just a small flower this time, quite dainty, with a little retro look to it. At just £4.99 per mt and 2 pretty colours to choose from I'm sure you will be pleased. Just a last few words on the pattern. There is a simple 5/8" hem on the armholes, this is sewn before the side seams, it makes it a much simpler job by doing it in this order. There is a simple facing around the neckline which is sewn on after the zip. Last but not least it is worth mentioning that not everyone likes making the tie end. This is a long piece of fabric folded in half lengthways and turned right side out. It is then threaded through the 'casing' which you make between the top and the bottom pieces of the jumpsuit. This can be a tricky job and especially if this is a last minute make, you need it to be made up quick and placed in that suitcase! So an easy option is use a co-ordinating or contrasting Cord. We have different thicknesses and lots of colours on the Minerva website and if you are worried about the ends fraying, enclose that 'end' in our easy to use Cord Ends (in either black, brown or white), these are just 29p each and saves the cord from fraying. Take a look too at these ones too, these are at a slightly higher price of £1.59 for 2 but it does give you the option of navy. If you don't like the idea of a plastic end (although you would be surprised at how good they do look) try knotting the end of the cord about 1 1/5" from the end and just 'comb' out the ends and trim straight. This also would look quite effective. BHL Pattern Testing - The Sabrina Dress! Its been a while! I hope you have had a great summer. I've been very lucky in having two holidays this summer. The first to Florida with one branch of the family and the second to Lanzarote with another branch of the family. What with holidays, hosting the Minerva Crafts Meet Up event back in June and launching our new website you can imagine I haven't had much time for blogging these past weeks. Talking of our new and improved website, you may have noticed that the Minerva Crafts Blog (that you are reading now) has been designed now as a place for myself and my daughter Vicki to blog about our personal sewing projects, plus 101 other things to do with Minerva Crafts and the crafting world in general. And of course we fully intend to blog each month again for the Minerva Crafts Blogger Network - our projects have been sorely lacking recently - must do better! Part of the plan with the new-look for the blog is for Vicki and I to blog more often about our personal crafting projects - so we will be writing this blog together, with both of us contributing posts that we hope you will enjoy reading. 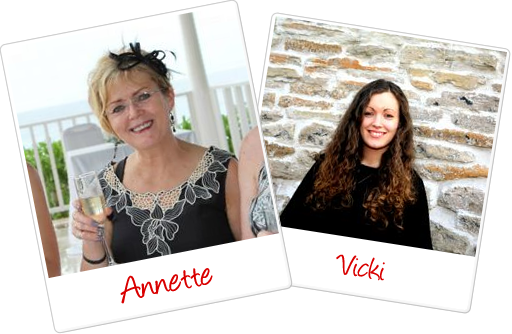 We have some very special sewing coming up soon with Vicki getting married next year. Between us we are making Vicki's wedding dress, 5 bridesmaid dresses, my outfit as mother of the bride and various other things for the big day. So keep tuned on the blog for this! Since we last spoke we now have our very own sewing/craft room at work! We absolutely love it! We are so lucky to do the job that we do. Having this room at work will allow us to bring you more projects to inspire you to get sewing, knitting and crafting. In the job we do we are constantly surrounded by products, people and ideas that inspire us. We hope to share some of that with you and hopefully inspire you too. We will show you a little guided tour of our new craft room in a future blog post - promise! Another section to the newly-designed Minerva Crafts Blog is a category for ''. Now this only came about recently when the lovely girls at By Hand London got in touch and asked if either Vicki or myself would like to be pattern testers for their new PDF pattern 'The Sabrina Dress'. Well, I jumped at the chance! I havent used a BH pattern before. We've stocked them for a while now here at Minerva and I've been itching to give them a go ever since they landed. I know Vicki has too - in fact shes already got herself a copy of the Anna pattern. Anyway, back to the Sabrina. It is a simple styled dress with princess seams. There are two variations. The first is a button up style with rouleau straps. I imagine this as a super sundress in a soft cotton fabric or linen. The second is a high neck, sleeveless dress with a centre back zipper. The possibilities with this pattern are endless. It could be your new 'little black dress' or it could be worked in a sumptuous sequin fabric, made longer and you would have a beautiful evening gown. Then with a little bit of alteration to the front and back piece you could make the button up front sundress into a zip up back sundress and the high neck zipped dress into a button or zip up front - so many options! I have chosen to make the high neck zip up back dress to start with. I have gone for this lovely ponte roma jersey fabric in plain black for the side panels and a black and grey floral patterned ponte roma for the front and back panels. Like I said I haven't used a BHL pattern before so was very pleased to see their instructions are really very easy to follow. This was my time using a PDF download pattern too. I must say I do definitely prefer the speed of paper sewing patterns as opposed to PDF's, but it wouldn't stop me using one again if a PDF was my only option. I like the little comments they add on the BH patterns such as when joining the princess seams they state, "The curves of the dress front are trickier to ease, so take your time and use plenty of pins!" - so helpful for beginner-sewers. I particularly like the way they have described how to make the rouleau straps, although I havent made this style (yet!) I still read all the instructions when pattern testing. On fitting my dress I realised I didn't actually need a zip as the pattern suggests because the fabric is stretchy enough to be able to get the dress on without one. The only difference I made in cutting out the dress was to make it one inch (25mm) longer, I wanted the length to be on my knee, not above it. And so I did my usual stretch stitch hem. As I've mentioned in other posts in the past, I stitch the hem and then trim right up to the stitching and the hardest part of this is that it could be so easy to snip into the dress fabric. I decided on using Applique Scissors this time which have quite funny-looking blades. They are described as a Duck Bill blade which keeps the lower layer of fabric away from the upper to allow close cutting in applique work. Why haven't I used these scissors before for my hems? They are amazing! I felt quite comfortable cutting very close along my hem and the result was brilliant. Hope you like the finished dress. I wore it to go for a meal for my birthday. We had a lovely night and I think you always feel good when you're wearing a dress you've made.